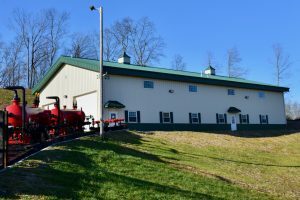 Completed and occupied in 2018, Building 23 is located at the northwestern edge of Complex 3 on State Route 821 between State Route 60 and I-77 Exit 6 near Marietta, Ohio 45750. Like all of our buildings, this one is fully customizable to meet lease-holder requirements. All properties include concrete entrance, driveway, and parking spaces. Directory signage at entrances and on buildings are provided by BCP. Monthly fees include snow removal, lawn maintenance, sewer, water, lot repair. For details email George Broughton and Debbie Davis or call 740-374-9396.